Happy Friday!! Look at these beautiful, perfect lemons! I've never seen such amazing lemons before - they came from a friend, whose parents grew them on their lemon tree in California. I've been trying to decide what to do with them and I think I'm going to make a lemon cake, with a lemon syrup poured over the top. 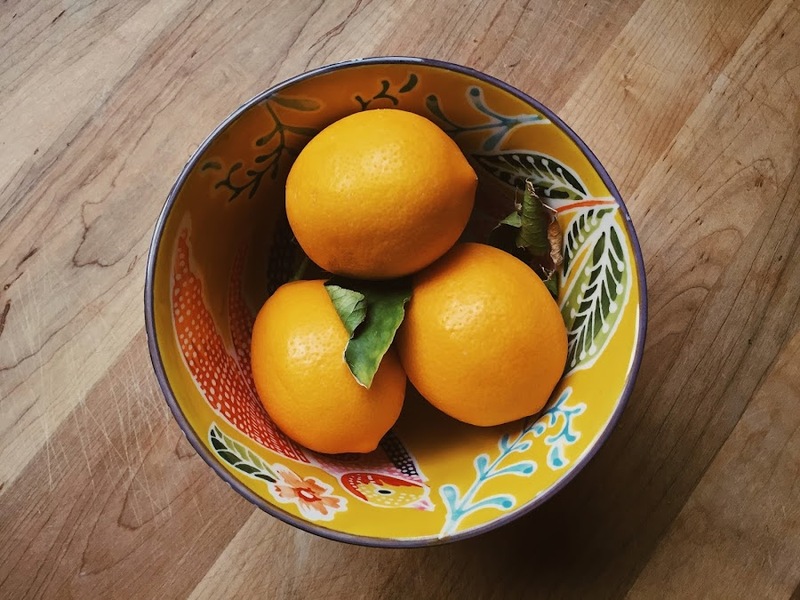 We've been quite the citrus household lately, eating little mandarins and clementines nonstop, and putting marmalade and lemon curd on everything. I even put some lemon curd on a pancake the other day and rolled it up like a little lemon taco. It was fabulous. An argument broke out recently, I won't say who said what (it was me), but the conversation went a little something like "Are you bleep-ing kidding me? Did you really eat all the marmalade??!" You'll be relieved to know that I still love and adore my husband very much, and I went out and bought some more marmalade. It's all ok. Some fairy tales are older than previously thought. This version of mac 'n cheese sounds pretty amazing. A girlfriend just sent me a gift covered in Wrappily paper - do you know about this line of eco-friendly wrap? It's darling!! Really cute make-your-own dream catcher. Julia wants one, and I looked around for some ready made options, but I think it might be more fun to really customize something homemade. LOVE the look and sound of these herbal remedy teas! These Parisian enamel lockets are beautiful. "How I turned my kid into a reader." Cool Book of the Week: 'My French Kitchen' by Joanne Harris and Fran Warde. I was so happy to discover that the author of 'Chocolat' had written a cookbook! Two of them actually. I've always loved the way Harris writes about food, specifically desserts, in her books, and I'm excited to read an actual cookbook of hers - filled with recipes that have been passed down for years in her family. One of the reviewers on Amazon claims to have made the chocolate cake recipe from the book every week, because she likes to have one slice every day. I've placed a hold on this one from my library to check it out. I want to see her spiced hot chocolate! Those lockets are so lovely. Like little easter eggs! Happy weekend! That camera post is awesome!! Those dream catchers are about to be the gift Lulu gives to all her friends this year. Great find! seriously. I had a friend give J a box of printed out plain paper dolls with a box filled with fabric scraps, and a brand new scissors - best birthday present ever! I think it would be very cool to assemble the materials needed plus a printout of that post with the instructions, place in cute box and voila, cool crafty birthday present! Oh, and tea! I want some hot tea. I LOVE lemon, and there is nothing like homemade lemon cake. The bad thing is I used to bake a lot-but now, I don't know-I kind of feel like I have lost my mojo or something. I really need to get back into it, because baking was a favorite thing of mine. My daughter had a dreamcatcher when she was little-it really did help with her bad dreams. We have a Native Alaskan craft store down the road, so we were able to pick a couple up there. She was in the bottom bunk of a bunk bed, so we placed it right above her head, and every night we talked how the bad dreams would be caught in the web. Interesting post about how she turned her child into a reader, for us the breakthrough was manga. She always loved books, but was a slow start with independent reading-I really feel the BOB books and the manga for young children helped everything to click. She is now an English major, with a reading list that has to be seen to be believed! yah I can't believe I had no clue about her writing a cookbook, much less TWO cookbooks!! I love your story about your daughter's dreamcatcher! I'm going to go collect the materials, put them in a box, and give it to my kiddo for her birthday. And now an English major! That's what I was as well. And guess what my favorite class in college was? CHILDREN'S LITERATURE. Best class I ever took! Talking about raising readers, my four year old and I have started listening to audios together. I love it. We just got a Vtech Kidizoom camera for my daughter this past December. She loves it.